"There is a growing consensus in the scientific community that small doses of pesticides and other chemicals can have adverse effects on health, especially during vulnerable periods such as fetal development and childhood." In the first principle of achieving optimal health, I focused primarily on the importance of eating more nutritious foods. After you start to improve the nutrient content of your diet, you then have to start focusing on avoiding as many dietary and environmental toxins as you can. While chronic exposure to individual toxins may not be very destructive to your health, collectively, these toxins can cause chronic stress and/or mess with the proper function of the endocrine system. So even if your diet is 100% on point, chronic exposure to the multitude of environmental toxins typically found in industrialized countries (especially the US) can relentlessly chip away at your health. Being assaulted by any toxin can cause a stress response as the body detoxifies itself. If you are constantly assaulted by many toxins every day, then you can suffer from chronic stress and endocrine disruption. Chronic stress brings excess cortisol which can strip muscle, increase body fat (especially abdominal fat), cause insulin resistance, sap energy, and suppress the immune system. A malfunctioning endocrine system prevents the body from using hormones correctly to manage essential life processes. Both chronic stress and endocrine disruption accelerate the development and progression of disease. Of course, nature is full of dangerous chemicals. I'm not talking about these natural toxins. I'm talking about man-made dietary and environmental toxins that are a consequence industrialization. These toxins were largely an unintended consequence of the Industrial (both first and second) and Green Revolutions. While these revolutions lifted peasants out of poverty and produced an abundance of calories, it also allowed for the creation of dangerous synthetic chemicals, destructive pollutants, and unhealthy pseudo-foods. 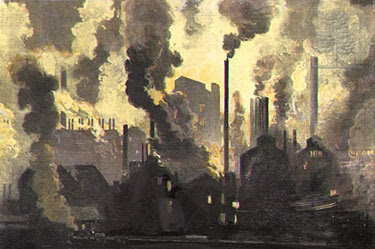 An artist's depiction of early industrial pollution. 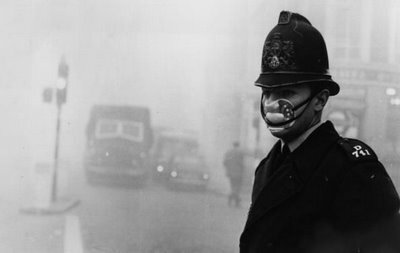 A London police officer tries to protect himself from The Great Smog with a "smog mask." The Industrial Revolution didn't just pollute the air, it also polluted water. Of course, humans have unknowingly polluted their water sources with raw sewage for many centuries. Sometimes this pollution was so bad that it led to many outbreaks of infectious diseases like typhoid and cholera (however, the connection between human waste and infectious disease wasn't realized until 1854). But industrial waste water was something else, adding both conventional (e.g., oil and grease) and unconventional (e.g., mercury, lead, and cadmium) pollutants into common waterways. By the 1950s and 60s, waster water pollution had gotten so bad in Ohio that the Cuyahoga River actually caught on fire several times during these two decades. In other places, many species of fish became so polluted with mercury that they were unsafe to eat. 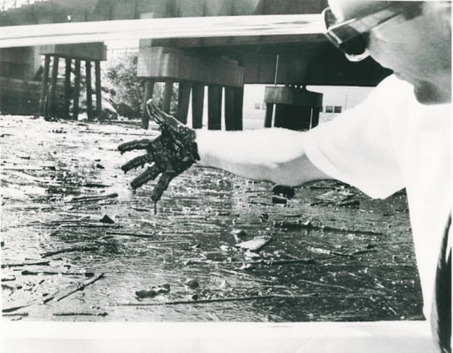 The degree of pollution in the Cuyahoga River was so bad in some places that it could coat a person's hand in oil and grease. These oils slicks would occasionally catch on fire. This picture shows how the man-made pollutant polychlorinated biphenyl (PCB) can move up the food chain. As it moves up, it concentrates. This means that phytoplankton will have the least amount of PCBs while the herring gull (or humans) will have the most. Today, government regulation has reduced or eliminated much of this earlier pollution. And even though air, soil, and water quality has improved, there is still environmental toxins hanging around. Burning fossil fuels releases air pollutants. Residues of banned synthetic chemicals (e.g., dioxin, PCB) are still found in waterways. And endocrine-disrupting pesticides, herbicides, and fertilizers pollute soil, water, and food products. Being exposed to any of these toxins on a daily basis can cause chronic stress (and disease) in the body. Originally, all humans were hunter-gatherers and ate different amounts of meats, insects, eggs, vegetables, and fruits. Then, about 10,000 years ago, human populations started transitioning towards agriculture. One of the new crops to make it out of the Fertile Crescent was an ancestor of modern wheat. Vegetable oils are another example of progress gone wrong. In 1911, US manufacturers began to produce more polyunsaturated seed and nut oils for human consumption. Unlike butter, lard, tallow, or olive oil, vegetable oils need an intensive industrial extraction process (heat, pressure, and chemicals) to release the mostly polyunsaturated oil contained in seeds and legumes. Since polyunsaturated oil is very delicate it goes rancid as it becomes something edible (see below). Of course, customers won't buy rancid oil, so chemical deodorizers are used to remove the unpleasant odor that indicates that an oil has gone bad. If these deodorized/unsaturated oils are to appear solid at room temperature (like butter), then they have to be hydrogenated. Both partial and full hydrogenation create unhealthy man-made trans fats because the hydrogenation process is not 100% efficient. (17) The unhealthy nature of both rancid oils and trans fats are now well known. 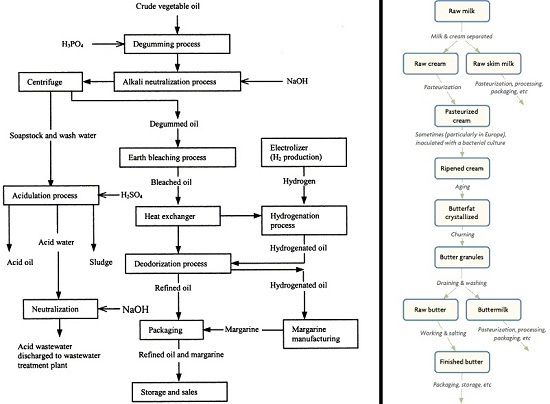 Here is the difference between the industrial process needed to make refined oil/margarine (left) and butter (right). Other than the heat of pasteurization (which isn't necessary to make butter), butter is made by separating, aging, and churning milk. Margarine's journey is much different, requiring heat, chemicals, and hydrogenation. Click here for larger image. Unscrupulous businesses in the US during late 1800s (primarily in cities) were cutting as many corners as they could to produce a cheap and profitable product. Some of these shortcuts exposed customers to dirty foods that spread lethal infectious diseases. 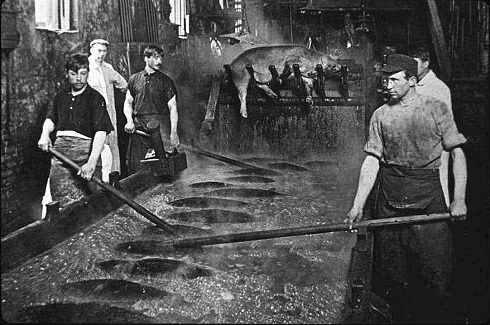 This photo shows the grizzly conditions in a meat-packing plant before passage of the Meat Inspection Act in 1906. Today, consumers are still threatened by dirty foods. The CDC estimates that every year at least 48 million Americans are made sick because of dirty food. Government regulators can only see so much and foods labeled "certified organic" don't guarantee that a food is pathogen-free. Aspirin can destroy the stomach. Acetaminophen (Tylenol) can destroy the liver. Corticosteriods have particularly nasty side effects. Being a pharmaceutical form of the stress hormone cortisol, it can produce all the side effects of a chronic excess of this powerful hormone: Abdominal obesity, suppressed immune system, poor wound healing, insulin resistance, insomnia, and muscle wasting. Lipitor can raise blood sugar and cause memory problems. So long as the human body is supplied with the nutrients it needs, it can do a pretty good job of dealing with a fair amount of toxin damage. (13) Unfortunately, humans currently living in Westernized countries usually eat a nutrient-poor diet while also being subjected to a never-ending stream of dietary, environmental, and pharmaceutical toxins. This one-two punch sets the stage for disease by causing both chronic stress and endocrine system interference. Of the many problems caused by dietary and environmental toxins, chronic stress is probably the most dangerous. When the body is stressed, it primarily uses the hormone cortisol to keep the damage from all this stress from getting out of hand. And when most people think of stress, they usually think of being exposed to too much anxiety, worry, work, or exercise. But any kind of stress can produce a stress response. This means that individuals also have to watch out for stressors like poor nutrition, toxin exposure, and infection load. I will cover the health effects of chronic stress in greater detail in the next installment of this series. Another example is the dietary wheat toxin wheat germ agglutinin (WGA). WGA is very small and can easily pass through the gut barrier and move into the bloodstream. It can then bind to both insulin and leptin receptors. Depending on what the level of insulin is, WGA can either keep insulin working longer than normal (causing more energy to be stored in fat) or block it altogether (causing excess blood sugar). When it binds to leptin receptors, it can cause leptin resistance. Both of these hormone binding characteristics of WGA can contribute to obesity. In today's modern world, we are constantly exposed to unhealthy dietary, chemical, and synthetic toxins, making complete avoidance next to impossible. However, I don't think that you have to avoid them all to be healthy. After avoiding the 7 Deadly foods and filtering your drinking and shower water, you can continue to protect yourself by boosting your health--especially the health of your liver and immune system--with high-quality food and smart supplementation. Eat more nutritious whole foods. It is possible to mitigate the effects of toxins by simply consuming optimal levels of essential and beneficial nutrients (e.g., vitamins, dietary minerals, essential fats, essential proteins, antioxidants). Eat organic foods. To be allowed to use the "certified organic" label, food manufacturers have to grow and produce their foods by a specific set of guidelines, which generally creates foods that may have more nutrients than industrially-produced foods. These foods may also contain less toxins (e.g., herbicides, pesticides). Eliminate the 7 Deadly Foods from your diet. The easiest way to reduce your toxin load is to eliminate the ones you eat every day. That means avoiding (or limiting) your exposure to refined sweeteners, wheat (and other gluten grains), rancid industrial vegetable oils, trans fats, or chemical additives. Gently cook and ferment most of your food. Not all foods can be eaten raw because they have chemical (e.g., lectins, phytic acid) or pathogenic (e.g., e. coli, listeria) toxins. Most of the toxins that can be found in some vegetables, meats, grains, legumes, and eggs can be neutralized by gentle cooking or brief fermentation. Stop eating pseudo-foods. Reducing or eliminating your intake of shelfable foods that come in a box, bag, or can also help you reduce much of your dietary toxin intake. 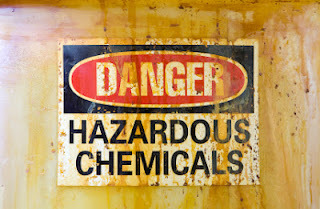 Eliminate common sources of environmental toxins. Filter your water, avoid plastic containers, be careful of synthetic materials, and air out your house every week. Use supplements to help the body expel toxins. Supplements like high-quality vitamin/mineral powder, milk thistle, curcumin, vitamin C, alpha lipoic acid (ALA), Chlorella, N-acetyl cystine (NAC), omega-3, and D-mannose can all offer some protection from toxins like heavy metals, free radicals, AGEs, and WGA. A formerly healthy traditional diet that has been infiltrated with pseudo-foods like modern wheat flour, refined sweeteners, industrial vegetable oils, unfermented soy, gluten grains, trans fats, pasteurized dairy, and chemical additives. An environment filled with synthetic chemicals that screw up our hormonal signalling. Drugs that don't protect us from disease, they simply trade one unpleasant symptom for another. When a poor diet and lifestyle is combined with these everyday toxins, the human body seems predestined to develop diseases that require drugs that carry with them powerful side-effects. However, if you can clean up your diet and eliminate your chronic exposure to common dietary and environmental toxins then the human body will naturally be strong, vibrant, and healthy. Think of this approach to healthy living as building a capable military unit to fight a war. If this unit is well supplied, maintained, and allowed adequate respite between battles, then it can fight effectively for decades. However, if this unit is sabotaged and continuously ensnared in battle after battle, then it will quickly become exhausted and fall apart from fatigue. The best approach to avoiding (or minimizing your susceptibility to) degenerative diseases is by eliminating all pseudo-foods from your diet, eating more organic meats, eggs, vegetables, and fruits, only drinking filtered water, using smart supplementation, and exercising 3-5 times a week. In my next post, I'll talk about how controlling the chronic stressors of modern life can eliminate (or reduce) most of the symptoms of metabolic syndrome. 4. Colborn, Theo, Dumanoski, Dianne and Myers, John Peters. Our Stolen Future. Plume. New York : Penguin Group, 1997. 5. Price, Weston A. Nutrition and Physical Degeneration. La Mesa, CA : The Price-Pottenger Nutrition Foundation, Inc, 2008. 6. Lindeberg, Staffan. Food and Western Disease. Ames, Iowa : John Wiley & Sons Ltd, 2010. 7. Braly, James and Hoggan, Ron. Dangerous Grains. New York : Penguin Group (USA), 2002. 8. Davis, William. Wheat Belly. New York : Rodale, 2011. 9. Yudkin, John. Pure, White, and Deadly. New York : Penguin Books, 1988. 12. Agrarian diet and diseases of affluence – Do evolutionary novel dietary lectins cause leptin resistance? Jönsson, Tommy, et al. 10, s.l. : BMC Endocrine Disorders, 2005, Vol. 5. 13. 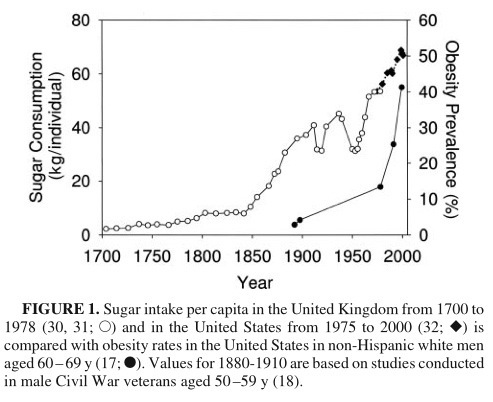 Origins and evolution of the Western diet: health implications for the 21st century. Cordain, Loren, et al. 2, s.l. : American Journal of Clinical Nutrition, 2005, Vol. 81. 14. Farris, Russell. Potbelly Syndrome. Laguna Beach, CA : Basic Health Publication, Inc., 2005. 20. Schmid, Ron. Untold Story of Milk. Washington, DC : NewTrends, 2009. 24. Talbott, Shawn. The Cortisol Connection. Alameda, CA : Hunter House Inc., 2007.